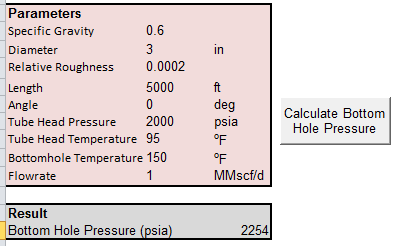 Many reservoir engineering calculations require the static bottom hole pressure. However, this can be difficult to measure experimentally. A number of researchers have developed other techniques to calculate bottom hole pressure from measurements at the wellhead. It needs to be numerically integrated. In the attached spreadsheet, we have simply divided the entire length into four sections and integrated via a simple trapezoidal method.